It is no secret that I love skirts. I wear them to work, I wear them out--I just wear them all the time. Even in winter, which usually begs people to ask "aren't you cold? ", which is a hard no. Tights and leg wear are my savior in the cold weather seasons, and my favorite have to be by Berkshire. You may have seen some of my prior blog posts about Berkshire tights, and I can honestly say that they only get better and better. Dressy, trendy and available in extended sizes, Berkshire is a winner. So, because it is getting colder outside (we have snow on the ground!) 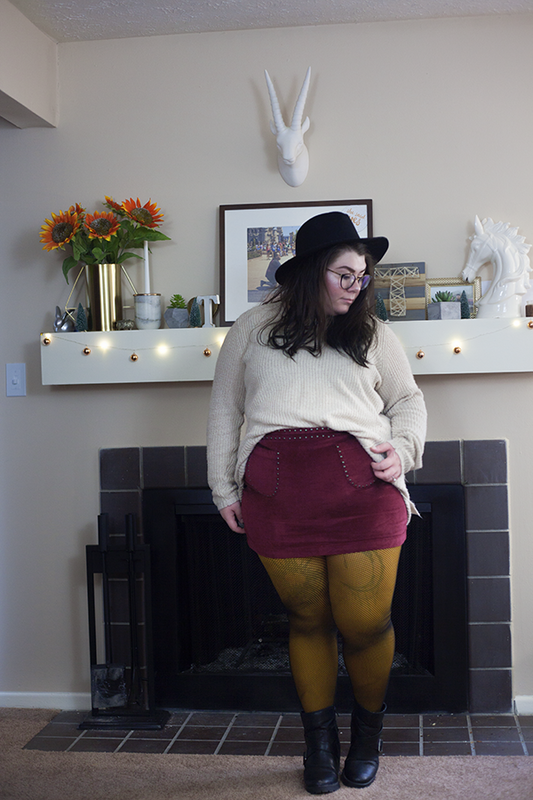 and my skirt love shows no sign of stopping, I wanted to showcase an outfit that you could wear right now that is going to keep you warm and stylish, even if you have snow on the ground. 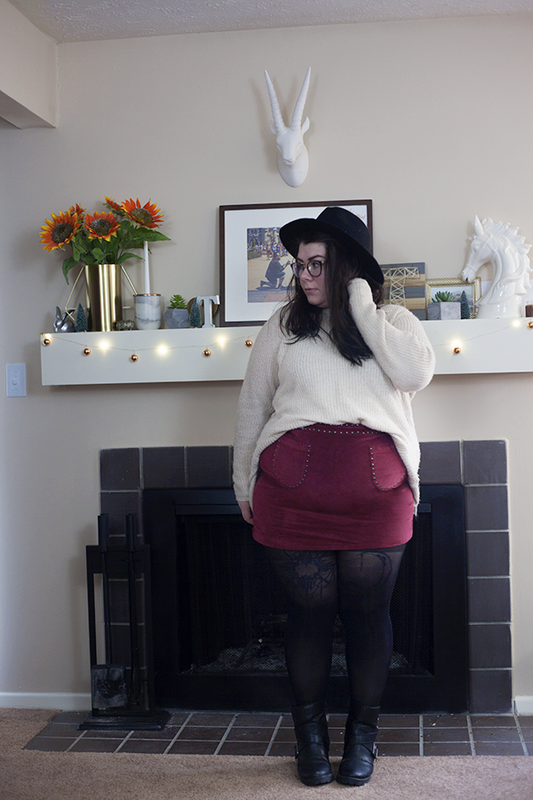 For the main outfit, I have an old cream sweater half tucked in to this cute studded faux. suede mini skirt. This outfit begs for some sort of legwear for balance, as the legs are bare as the top is covered. These Easy On tights are the best, as they are comfortable and stay tight to the body, so they don't fall down throughout the day. I love the look of a sleek black tight with this outfit because it allows the colors of the rest of the items to pop. These Shimmers Opaque tights are fantastic for adding a bit of shine to an outfit without looking like a child. Just as comfortable as the Easy On tights, these are great for an added texture to an outfit. I wouldn't usually wear sheer thigh highs, but I do really love the romantic lace garter of these. I think that paired with a slightly shorter pair of boots would be so adorable. The Romantic Lace Thigh Highs have a built in garter to help the thigh highs stay up. It's a bit too cold for just fishnets, but fishnets on top of a colorful tight is such a cool and edgy look! I added these fishnets over a mustard yellow tight for some visual interest and added color and I really love the look. These trendy fishnets are perfection. You can find these tights and thigh highs at Berkshire's site, and you can check them out on Instagram and Facebook! I was provided this collection of legwear for free, but all opinion are my own.